For the most time I have been in my current flat, the little store in the ground floor was filled with a computer store. The guys where nice, even had some hints for me from time to time but obviously they did not suceed with their business and closed last year. Some months later people started to build a café there. This was of great delight to us since we have many bars in our neighborhood but no nice cafés to sit and read newspapers. In september, Café Solvey opened finally and we instantly became friends with Solvey and her family who run the place. It’s warm and cosy, with very old porcelain, self-made cake, soft armchairs, a kids corner with toys and a fake, yet very well done chemin. And when Solvey asked me to help her out with a website I could not say no. Jimdo was the system of choice to build it fast and easy and when I see now that Solvey herself (who is not a big fan of these “computer things”) edits the events on her page and adds products, I know it was the right decision – Jimdo obviously easy to use. And I earned myself a couple of coffees, breakfasts and cakes! 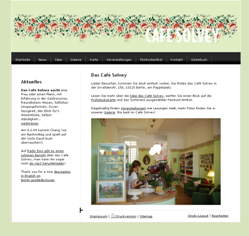 Take a look at Solvey’s website, more importantly, visit the café if you are around and leave a comment in the guestbook!